"Friendly and welcoming. The room was immaculate and so nice and warm (which you can control for yourself), hot shower with excellent water pressure. Great black out drapes for those longs sleeps after longer flights. No noise from neighbouring rooms or car traffic from the road. Location is walkable to town and restaurants. Beds are supremely comfortable and even had electric blanket option. (It's winter right now). Kitchen facilities make it easy to cook your own stuff and have a quiet night in. Not a single complaint - for real!" "Stayed for 3 nights on a work trip. The room was heated prior to my arrival on a chilly Nelson night which was fantastic. Large tidy room which was serviced every morning. Very fast unlimited free wifi. Best part was the hosts/owners went above and beyond when they dropped me off to the airport- the taxi was taking a while to arrive and i had to get there in a hurry! Small town NZ charm- unbeatable. 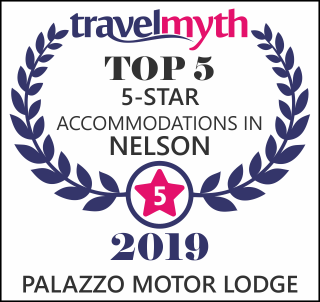 I highly recommend Palazzo motor lodge." "I stay in Nelson on business every month for a couple of nights. I have tried quite a few motels around town however, once I stayed in the Palazzo I will not try anywhere else. From the time you get to reception to the time you leave you are made to feel at home. Murray and Jenny are excellent hosts and will provide you anything you need. Once you get to your room which is immaculately presented you will notice that you have everything you need for a good stay. Very comfortable beds with good bedding. A personal heat pump in the room (very important in summer as most places in Nelson only offer heating and not a way to cool off the room) Nice size TV's, good soap amenities, coffee and tea, fully stocked kitchen and the best thing for someone on business and personal alike is your room comes with fiber broadband. Id say it would be the fastest internet for motels in Nelson." "I stay at the Palazzo once a month for work. The rooms are immaculate and extremely modern. The owners are super lovely and are great to deal with. The rooms with the lazy boys are my favourite! They have a Great range of room configurations to suit every need. I even had the luxury of staying in the presidential suit one visit. Let me tell you..... I didn't want to leave. Very very flash. Whether it be for buisness or pleasure i highly reccommend palazzo Motor lodge!!"